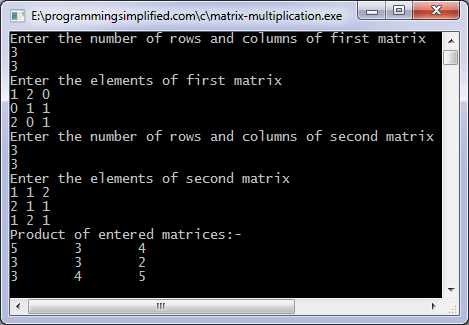 Matrix multiplication in C language: C program to multiply two matrices (two-dimensional arrays) which will be entered by a user. The user will enter the order of a matrix and then its elements and similarly inputs the second matrix. If the orders of the matrices are such that they can't be multiplied by each other, then an error message is displayed. You may have studied the method to multiply matrices in Mathematics. Matrices are frequently used in programming and are used to represent graph data structure, in solving a system of linear equations and have many other applications. A lot of research is being done on how to multiply matrices using a minimum number of operations. You can also implement this program using pointers.